Child Aid Foundation (CAF) was registered in 1993 to help poor and needy children complete their education to the level they desire and their capacity to achieve. CAF also supports children for their higher studies. The activities of CAF include three projects namely ‘Vidya Education project’, ‘Ashraya Home project’, and ‘Balika Girls project’. The children covered by these projects are in the age group of 6-21 years and belong to poor families. Orphans and semi orphans are given preference by CAF. However, children having both parents but who are in a critical financial situation are also supported. CAF has a centre in Vijaywada city of Andhra Pradesh and it reaches out to beneficiaries in and around Vijyawada. The centre includes buildings owned by CAF constructed on land donated by the government. Comprehensive aid and care is provided to the beneficiaries on residential as well as non-residential basis. The aid and care includes nutritious food, clothing, shelter, education, vocational training, medical care, counselling and job placement. CAF is supported by various reputed organisations in India and abroad. They maintain that they are one of the best known and respected NGOs among the Telugu NRI community. Total Income: In FY13, CAF posted total income of Rs5.8mn. Of these, domestic donations accounted for Rs2.9mn or 50% of total income and foreign donations accounted for Rs2mn or 34% of total income. CAF is supported by private donors in India and abroad. These include individuals and organisations such as Give India, Apex Foundation, Charities Aid Foundation, Live For Children, Asha For Education and Telgu Association of North America (T.A.N.A.). As is evident from the historical data, the funding sources have varied considerably during FY10-FY13. CAF, however, feels assured of improved and stable funding in future. Foreign funding ranged from 21% to 47% during FY10-FY13 whereas domestic funding ranged from 43% to 63% during the same period. Interest income accounted for 16% of total income in FY13 and has been relatively consistent at Rs0.8-0.9mn during FY11-FY13. (Refer Fig 1). 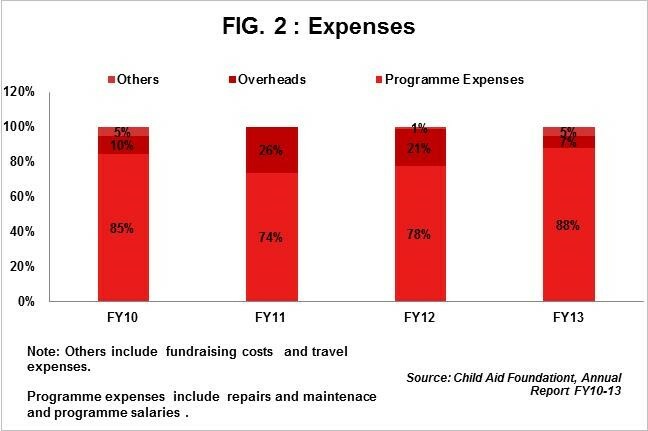 Programme expenses Vs Overheads: In FY13, total expenses were Rs4.9mn with expenses to the tune of Rs3mn incurred on repairs and maintenance of schools and hostels run by CAF. As these expenses are significant and critical activities of CAF, we have included them in programme expenses. Other programme expenses consist of spending on children’s maintenance and programme staff salaries. Children’s maintenance includes the cost of food, clothing, personal supplies, shelter, education and educational supplies. This aid is provided according to each child’s individual situation and requirement. Programme expenses accounted for 88% of total expenses (sector average: 78%) and overheads accounted for 7% of total expenses (sector average: 13%) in FY13. CAF’s programme expenses are relatively high as compared to previous years as well as the sector average which is a positive effect. Overheads exhibited a decreasing trend during FY11-FY13 indicating improved utilisation of funds for programme activities. (Refer Fig 2). Fixed Assets: CAF owns land donated by the government and several buildings. In FY13, fixed assets accounted for 47% (Rs13mn) of total assets with Rs12mn worth of assets comprising of agricultural lands and buildings. Immovable assets accounted for 90% of total fixed assets. Investments: CAF has invested Rs10mn in fixed deposits to collect funds and ensure healthy liquidity in future. The fixed deposits have also been a steady source of interest income for CAF. Investments accounted for 35% of total assets in FY13 and ranged from 38% to 46% of total assets during FY10-FY12. Cash/Bank: The available data indicates that CAF has been maintaining high cash balances during FY10-FY13. The reason for such high balance cannot be commented upon due to lack of information. General Funds: General funds have recorded an increasing trend from Rs16mn in FY10 to Rs28mn in FY13. This is on account of a healthy surplus reported by CAF over the past three years. In FY13, general funds accounted for 100% of total funds indicating its strong financial position and lack of recourse to debt. Donors: CAF is mainly supported by individual donors in India and abroad. It has managed to continue its dedicated efforts for the past 21 years without depending on institutional or government funding. This indicates to some extent the confidence donors have in CAF and the strong reputation it has earned within society and the public. Many of the donors are ex-students of CAF who support CAF’s projects according to their capacity. Some of them have even used the HelpYourNGO website to make donations! Income Growth: CAF posted an income growth of 3.5% in FY13 as against a negative growth of 30% in FY12. The foreign funding dropped in FY12 leading to a sharp plunge in the total income, but demonstrated significant recovery in FY13. CAF’s income CAGR was negative 7% during FY10-13. Self-sufficiency ratio: The ratio measures ability of an organisation to meet expenses from its own funds. The ratio is calculated taking own funds as a percentage of total expenses. Own funds include donations and interest income. The self-sufficiency ratio in FY13 was 78% which is relatively healthy. Transparency: CAF invites existing and prospective donors to visit their centres and witness activities for themselves. This gives visitors an opportunity to decide for themselves whether CAF should be supported. CAF shares the progress reports of children with donors/supporters at regular intervals. This ensures transparency in functioning of CAF and assures donors that their donations are being put to the best possible use. Regular income: The historical data reveals that CAF enjoys support of individuals and organisations in India and abroad. 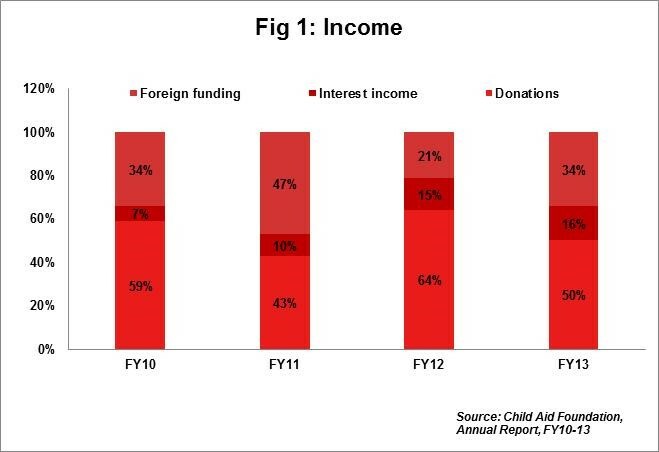 However, these donations (levels/sources) are inconsistent as is apparent from the income trends during FY10-FY13. CAF seeks sustainable and regular income for maintaining and improving the quantity and quality of their aid and care to beneficiaries. There are five trustees on the board of Child Aid Foundation. Of these, three are successful businessmen and one is a retired Joint Commissioner of Commercial Taxes, Andhra Pradesh. Dr Goswami, the founder and managing trustee of CAF has a Ph.D. in Indian philosophy. None of the trustees are related either by birth or marriage. The trustees meet twice a year, or as and when required. CAF is an official partner/ member of reputed organisations such as GiveIndia (India), Charities Aid Foundation (India and U.S.A.), Apex Foundation (U.S.A.), Asha For Education (U.S.A.), and T.A.N.A. Foundation (U.S.A). CAF has also been granted official recognition by the government (Department of Women Development and Child Welfare and Department of Education). CAF is accredited by Credibility Alliance for accountability and transparency. CAF displays the list of all its individual donors on the website as a token of thanks.